There are many wonderful photo opportunities possible while walking around Rome. I look for relationships between people and the environment. If I see something or someone that looks like it would make an extraordinary photo I ask myself first what are the conditions of light, contrast, color and potential composition. If a certain criteria is met I make all the necessary manual adjustments on my camera, approach the subject, often with discretion, and shoot it. 99% of every photo I take is done mentally before I shoot it mechanically. In the above image I combined the gesture of a statue with the action of a person playing guitar. The location is Ponte Saint Angelo, a bridge that crosses the Tiber River. 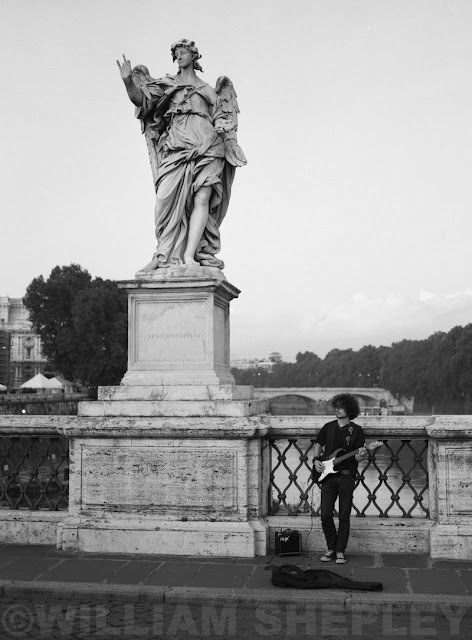 I visually recognized a connection between the statue of the angel and the guitarist, thus framed them as a visual pair. I especially saw the relationship between the hands of each figure and the 'repetition of form' they exemplified. The light and contrast were perfect for black and white photography. The soft hues of dusk filter evenly over the subjects and the background adds just enough information to give a 'sense of place' to the overall composition.